In days of yore an interregnum is the period between the death of the king and the coronation of the new king. That is, the interlude between the end of one realm and the start of another. It is thus a suitable description of the situation at VE3VN. You can get an idea of what I mean by the following picture. All my antennas are down, as are the towers, and I am QRT for a little while. The reason is that I have taken the most concrete steps of all in my long term plan: I sold my house in the city and purchased a rural property. There is a substantial acreage to accommodate my antenna plans. This is a big change in my life. Don't be surprised by the relative dearth of articles on this blog! As I write this I am uncertain about when I will be in a position to return to the air. I may get a small antenna raised just so I can operate a little, but that remains to be seen. Even though I was QRT for 20 years before my return to the air in 2013 I am now uninterested in a delay of even 20 days. Being in a position to operate the major autumn contests is an entirely other matter. I intend several follow-up articles to talk about the new QTH and how I chose it, and how I went about the winding down of activities here in Ottawa. So, yes, I am moving out of Ottawa. That is pretty much necessary for regulatory reasons since city rules are not easily compatible with tall or numerous towers. But with politically driven amalgamation of municipalities it requires travelling quite a distance to escape the city. Although I have not written about it there have been additions to my store of hardware, including the pieces of a Trylon tower you can see in the picture above. More about this later as well. Looking back on the previous 44 months of operating there are several achievements that stand out for me. Not surprisingly these involve my two main operating interests: DX and contests. There is also station construction, including antenna design and construction, and towers. First there's QRP. Hams who have only known me recently (since my return to the hobby after 20 years being away from it) think of me as a QRPer. Yet until I got back on the air after purchasing a KX3 I had never operated QRP. I was always a QRO operator, limited only by my budget and environment (neighborhood EMI). For this reason the contesting I did from my own station was done with the amplifier turned off. Luckily I got back on the air as this most recent solar cycle was arriving at its peak, low as it was. I was able to work 226 countries mostly using 10 watts (not true QRP, except when running 5 watts in contests) and small antennas. Indeed my first 100 countries were worked using the house eaves troughs as my antenna. Eventually I surpassed 100 countries on all bands from 40 to 10 meters, excepting 12 meters. With 100 watts starting in early 2015 and a tri-banders a few months earlier my DX totals climbed. 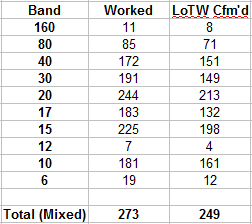 With my station now dismantled my worked and confirmed (LoTW) totals are summarized in the adjacent chart. As you can see I've done reasonably well. Countries that I've missed include those with no recent activity or in areas of the world that are particularly challenging from VE3 with my limited power and antennas. The one DX contact that most comes to mind when I think of what gave me the most pleasure was working VK0EK on 80 meters. With QRP it would perhaps be FT5ZM on 40 meters. Operating QRP in contests went surprisingly well. I achieved two consecutive world #1 plaques in CQ WW SSB and as high as #2 in CQ WW CW. I also compared favourably with the top US and Canadian QRP contesters in the ARRL DX contests, where the scoring allows better comparison. My best placing there was a #2 on CW. With those and many other QRP contests under my belt I look back on this period with fondness. However I am moving on and plan to primarily operate QRO in future contests; QRP is likely to make an appearance from time to time. The towers and other supports I've built are not remarkable. Even so I was pleased to be able to put into practice my experience and knowledge that allowed me to do all the work myself. Although I would not advise anyone to do tower work solo the opportunity allowed me to devise tools and practices to make it work and to be able to do so on my own schedule and not inconvenience my now smaller circle of local ham acquaintances. Most of those I used to do tower work with have moved, passed away, left the hobby or are too elderly to undertake the work. 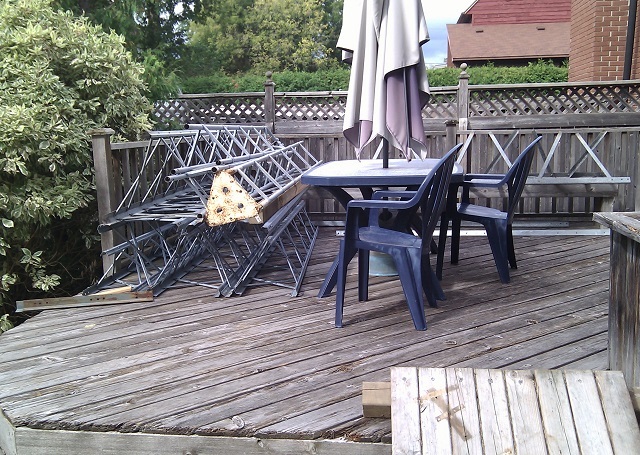 Dismantling was also a one-man job, but easier. However gravity is not always your friend when taking things down. But I'll leave that for a future article. Designing small, effective antennas for a small city lot can be more challenging than doing so for large towers on a large rural property. Eking performance out of a small package can be daunting. My approach to computer modelling is much improved, as are the tools. Whereas 25 years ago I wrote my own software to do SDC (stepped diameter correction) for yagis it is now a feature included with most modelling software based on the ubiquitous NEC2. Although I'd been out of the hobby for 20 years my improved knowledge of the underlying physics and practical approaches to getting things done paid dividends. Just living life and solving technical and business problems throughout my career does help in ham radio tasks. Age brings a few advantages. I set a goal to leave nothing behind at my city property. No concrete for towers meant that I had only to dig out my floating wood platforms that I used as tower bases and refill the shallow holes with dirt and plant grass seed. The guy anchor that is attached to the house has been repaired leaving only a circular wood patch where the pipe pierced the wall. The holes for the bracketed tower have been filled and covered by wood stain. Without a careful inspection of the property and house you'd be hard pressed to know that a ham had ever lived here. Perhaps the only lingering marks are the rings around the trees that served as guy anchors. I did not follow best practices for this, which would require an adjustable bolt through the tree. Since I intended to use the trees for only up to 2 years I was willing to risk using a cable girdle around the tree trunks. The trees have already begun their task of growing around the invading cables. That process takes more than 2 years. 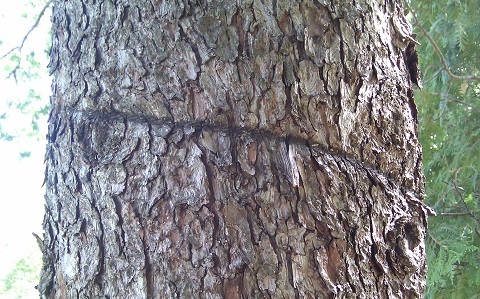 The static load on the trees from guy wire pre-load tension was light enough to not cause serious damage to the bark. In short, the trees are perfectly okay and should quickly heal from the damage I caused. Considering the dismay that some potential buyers expressed at the towers, antennas and masses of cables I think the new owners should be pleased with the remediation I've done. My realtor was amused that there was one potential buyer who expressed an interest in keeping the towers if they were to buy the house! I don't know if he was a ham, CBer or interested in OTA television. Now as I leave the house I built 23 years ago and where I first built a station 32 years ago there is some sadness. Surprisingly many of my neighbours are the same ones I had in 1984. They have been especially tolerant of my reentry to the hobby and the requisite towers and antennas. 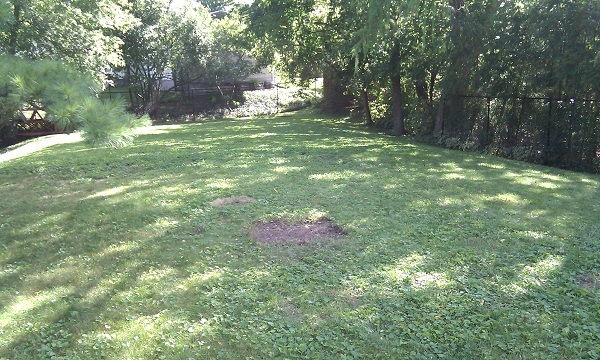 With the yard cleared of all trace of an amateur radio station it seems quite sterile to my eyes. But life moves ever onward. Possession date for the new property is only a few days hence. While the house is basically sound and of modern construction and amenities it has serious shortcomings. Those must be dealt with before I move in full time. I will commute while renovation is being done and for on-site planning of the new station. For the past weeks I could only work with the site plan and satellite images. The antenna farm will include several towers. How much I can accomplish before winter wallops us here in the Great White North is to be seen. The important thing is to prioritize the towers and then fit in whatever antennas I can. Since a high inverted vee will outperform a low yagi for DXing you should be able to appreciate my priorities. Some antenna work will be possible over the winter months. I will write more on the topic as time and energy allow. I have much to say but little opportunity at present for writing. Eventually it will all come out. I hope that readers will enjoy reading about my forthcoming adventure.